Baumann Wohlenberg - Solutions. Cutting system N° 3 - Fully equipped for high productivity! Fully equipped for high productivity! 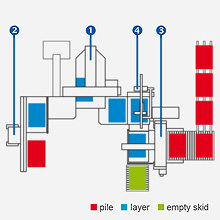 The cutting system N° 3 has been especially designed for the heavy industrial production. The system combines several automated components for highest productivity, at the same time relieving the operator of physical strain. 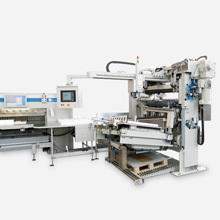 Which automation components does the system offer? 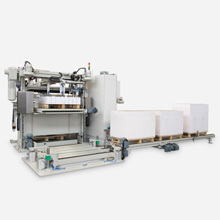 Transport gripper system BFS-V, removing the sheets from the BASA and offering the possibility of feeding the high-speed cutter via the front-table. What advantages does the system offer? All tables are equipped with micro-perforation so the operator can handle the material effortlessly. The system is equipped with a new de-stacking unit and a counting device. Even piles, composed of different signatures, printed sheets in different languages or different assignments can be processed automatically, accurate to the sheet and correctly sorted. Thanks to the logistic system a ‚non-stop‘ operation with maximum effi ciency is possible. The sheet-blocker allows the processing of partial reams with a height up to 50 mm. The unloader table is very thin and allows the highly accurate restacking even of small cuts.